Candidates in the general election (GE) held last month spent more than $7.1 million altogether, according to expenses submitted to the Elections Department. People's Action Party (PAP) candidates spent $5.3 million on the 89 seats the party contested, while the expenses of the eight opposition parties contesting these seats totalled $1.8 million. The Sept 11 GE saw the ruling party challenged in all seats for the first time since Independence. It won 83 out of 89 seats and 69.9 per cent of the votes. In all, spending in this general election was about 30 per cent more than the $5.5 million in the 2011 polls. Still, the average spending per voter was below the maximum $4 that candidates were allowed, a sum that was raised this year from $3.50 in 2011. The PAP spent $2.16 per voter and the opposition parties, 73 cents. Candidates are required under the law to submit their election expenses to ensure accountability and transparency in campaign finance. The biggest spender per voter was Minister for Culture, Community and Youth Grace Fu in Yuhua single member constituency: $2.97 on average. In all, she spent $67,114. About two-thirds of her expenses were on "advertising and printing of promotional materials". The expense records of the candidates show the wide variety of logistics needed to mount an electoral campaign. These ran from the basics, such as posters, banners and stage backdrops, to high-tech equipment. Staying connected was on top of the minds of at least two candidates. MacPherson SMC MP Tin Pei Ling and Social and Family Development Minister Tan Chuan-Jin, an MP for Marine Parade GRC, rented mobile Wi-Fi broadcasters for their campaign staff to stay online while on the go. The PAP also paid about $1,500 for "influencer engagement", which the party's executive director and Marsiling-Yew Tee GRC MP Alex Yam said were payments for a "long-term public relations consultant who helps to generate ad hoc content for our Facebook page". Some candidates opted to make their fliers and manifestos stand out. Fengshan SMC MP Cheryl Chan hired indie graphic design firm Sarah and Schooling to produce her manifesto, as well as her polling and calling cards. She spent a total of $3,050 on them, after discounts ranging between 60 per cent and 70 per cent. Food and refreshments were also another staple on the bills. While many candidates paid for at least some of the meals of their volunteers, Bukit Panjang SMC MP Teo Ho Pin provided a catered buffet for lunch and dinner for all nine days of the campaign. He spent more than $12,000 on food and refreshments. In Punggol East SMC, MP Charles Chong forked out $1,444.50 to print 18,000 "rebuttal fliers" that were probably on the disagreements between the PAP and the Workers' Party about the state of Punggol East's financial accounts. The biggest opposition spender was Mountbatten candidate Jeannette Chong-Aruldoss, who chalked up a $52,547.69 bill, or $2.18 per voter on average. She was the sole opposition candidate to spend more than $2 per voter. Her expenses included a candy floss machine at her rally ($600) and the filming and production of a video shot during Nomination Day and at a rally ($2,900). 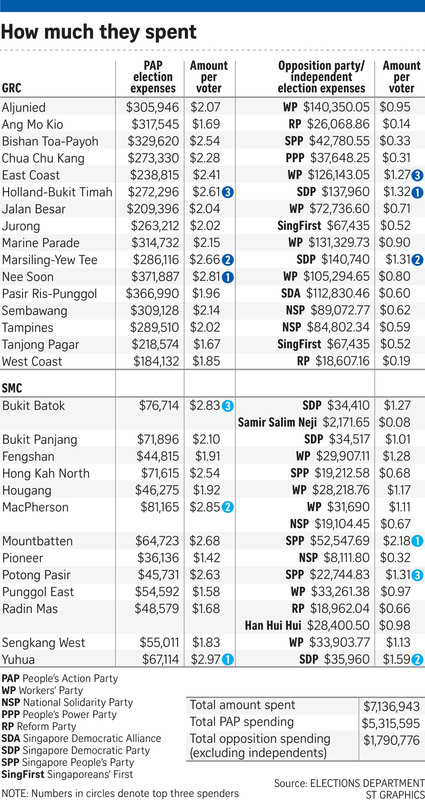 The Singapore Democratic Party spent $1.30 per voter on average, the highest among all opposition parties. The Workers' Party was second, at 95 cents per voter, while the Singapore People's Party spent 69 cents per voter. Reform Party spent the least per voter: 19 cents. The Sept 11 GE saw two independent candidates. They spent a total of $30,572, excluding the election deposits they lost for failing to secure at least 12.5 per cent of the vote in their constituencies. One of them is Mr Samir Salim Neji, who stood in single-seat Bukit Batok. He spent $2,171.65, the lowest amount among all the candidates. The money went to 50 campaign posters, 3,000 postcards, photo prints and petrol. The other is Ms Han Hui Hui, who contested single-seat Radin Mas. She spent $28,400.50, more than the $18,962.04 Reform Party candidate Kumar Appavoo spent contesting the same seat. People can inspect the candidates' expenses at the Elections Department for a period of six months, starting yesterday. They have to pay $2 for every candidate whose expenses they want to see.